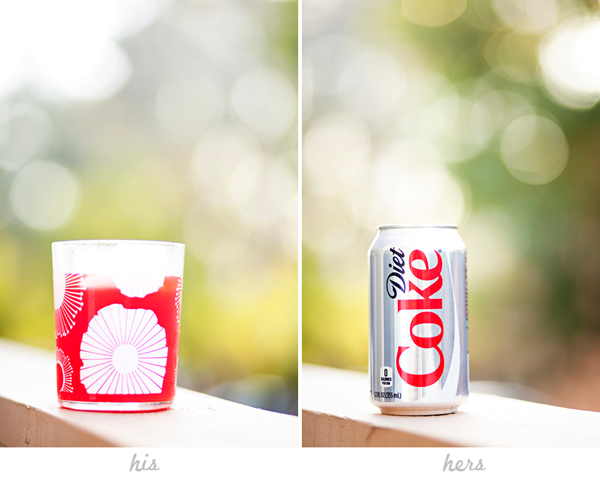 His/Hers is a weekly series started by Alli and Brooke (Horray and Pure & Noble)—I decided to join in the fun. It's true. Jason always always always chooses the flower cups. He calls them our "fancy cups" and drinks his (insert gatorade or any type of juice—except prune, straight cranberry or original v8 here) in them every time. And it makes me smile every time. That boy can down the juice/gatorade. I am not afraid to admit that I'm a Diet Coke girl. In the can—or fountain at Horkley's in Rexburg (best fountain drinks ever)—and no other way. I think it runs in the family or something. The whole soda thing started with a 22 oz Coke whenever I got a killer migraine, and now it's turned into a 12 pack sitting in my cupboard. Oops. At least I switched to Diet. I'm a Dr. Pepper girl. I have made a effort to cut it down though. I'm with Jas on the V8 though. I've always got that around too. I also drink a lot of water & milk. Now that I think about it, I drink a lot. I also love his choice of cups. First of all it is a darling cup, but when Layne says funny little things like, "I like that you keep a plant in the bathroom"... that kind of stuff...It just makes me giggle just a little. diet coke is my vice in life. i rationalize by saying "hey. it's only diet coke." Yum Yum, Gimmie some! Also an addict. Misery loves company so I am glad you hopped on over to the dark side! Also, I have these glasses at my house that when mom uses them she says she feels fancy. Next time Jason comes over, I will let him use one of my "fancy" cups! No prune juice here, either. And I can't wait until it's so hot that an icy soda sounds so good. Not happening here in snowy Idaho yet. Mom is totally lying...I saw her drinking an ice cold soda with my own eyes!! I didn't know you loved diet soda??? now I know. This is adorable. I just love coke cans. They're so classic. My hubby is the same way about mtn dew, nothing comes between them! i just wanted to say that i love your cute photography! EXACT same for me and landon. juice in a fancy cup for him. diet coke (fountain) for me.